Muscles connectin the upper extremity tae the vertebral column. Adducts, extends an internally rotates the airm whan the insertion is muived taewart the oreegin. When observing the muscle action o the oreegin taewart the insertion, the lats are a verra pouerfu rotator o the trunk. 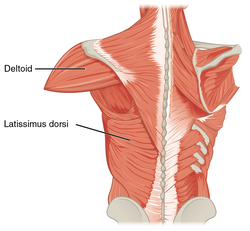 The latissimus dorsi is a lairge, flat muscle on the back that stretches tae the sides, ahint the airm, an is pairtly kivered bi the trapezius on the back near the midline. This page wis last eeditit on 24 Apryle 2018, at 00:25.